Camille Iverness can take care of herself. She's done so since the day her mother abandoned the family and left Camille to run their shabby curiosity shop on Blinkett Street. But when a violent betrayal leaves her injured with no place to hide, Camille has no choice but to accept help from the mysterious stranger who came to her aid. Jonathan Gilchrist never wanted to inherit Kettering Hall. As a second son, he was content working as a village apothecary. But when his brother's death made him heir just as his father's foolish decisions put the estate at risk, only the sale of a priceless possession—a ruby called the Bevoy—can save the family from ruin. But the gem has disappeared. And all trails lead to Iverness Curiosity Shop—and the beautiful shop girl who may or may not be the answer to his questions. 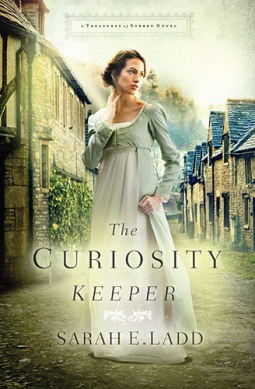 The Curiosity Keeper had all the right elements for a story that kept me turning the pages. Perhaps it is because movies during this genre are so popular, but Mrs. Ladd's descriptions of a cluttered shop, dank and dirty back alleys of London, and verdant gardens of the British countryside made me feel as if I were right in the places she pictured. I fully enjoy the polite and proper, yet dark and mysterious side of a Regency era tale. And, The Curiosity Keeper had all of that, showing that no matter your station, greed will corrupt all around you.